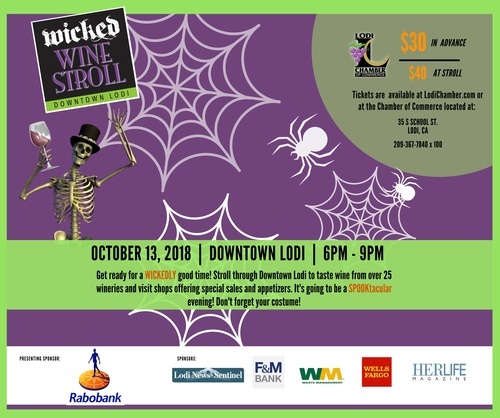 Downtown Lodi celebrates Halloween with the Wicked Wine Stroll on Saturday, October 13! Wineries will be pouring their newest vintages and wine makers will be discussing why Lodi is the home to a growing number of award-winning wineries. School Street shops and boutiques will serve delectable appetizers with special shopping discounts. Winners of the costume contest will be chosen in two categories- the Wickedest (scariest) and Most Creative. Three Downtown Businesses will also be recognized for best decor! For our out of town guests, Holiday Inn Express is offering a Wicked Wine Stroll package! For $199, receive two tickets to the wine stroll, one night stay, early check-in, breakfast, and a late 2PM check-out time. Call 209-210-0150 and mention the Wicked Wine Stroll package to make a reservation. PLEASE NOTE: Tickets purchased online will not be mailed. Tickets will be available at Will Call the night of the event beginning at 5:30PM. For questions or concerns, email Karen Cannon at KCannon@LodiChamber.com. If you need to pick up tickets from the WILL CALL LOCATION, come to the Chamber of Commerce at 35 S. School St., Lodi, CA (not the check-in locations at BSharp and King's Closet).